The second week of the season sees the tour shift to the south of Australia with a host of intriguing storylines to follow. The ATP World Tour moves to southeast Australia for one of the tour's oldest tournaments to be contested, the Sydney International. Having been played since 1885, the Sydney International has a rich history of champions with several possibilities emerging. Here's a look at how things will play out. The top seed is Stefanos Tsitsipas. The young Greek star already has some matches under belt in 2019 after competing in the Hopman Cup. After a first round bye, he'll face either Nicolas Jarry or Aussie Matthew Ebden. The ever dangerous Martin Klizan faces 19-year old wild card Alexei Popyrin. Frenchman Jeremy Chardy will come to Sydney having reached the semifinals in Brisbane and opens with eighth seed Andreas Seppi. This is by far the weakest of the four quarters with three qualifiers being placed here. Third seed Diego Schwartzman gets a bye before facing one of those qualifiers or Ryan Harrison. Another qualifier or Denis Kudla will face off with the third and final qualifier from the section playing sixth seed Lucas Pouille, now coached by two-time major champion Amelie Mauresmo. Fourth seed Gilles Simon's title defense in Pune ended in the semifinals with a loss to eventual champion Kevin Anderson. The draw did him no favors with either Malek Jaziri or Sam Querrey his opening opponent after a first round bye. Marton Fucsovics pushed world number one Novak Djokovic in Doha and will look to build on that performance as he faces off with James Duckworth. A possible second round opponent for the seventh seed will be either John Millman or Frances Tiafoe. 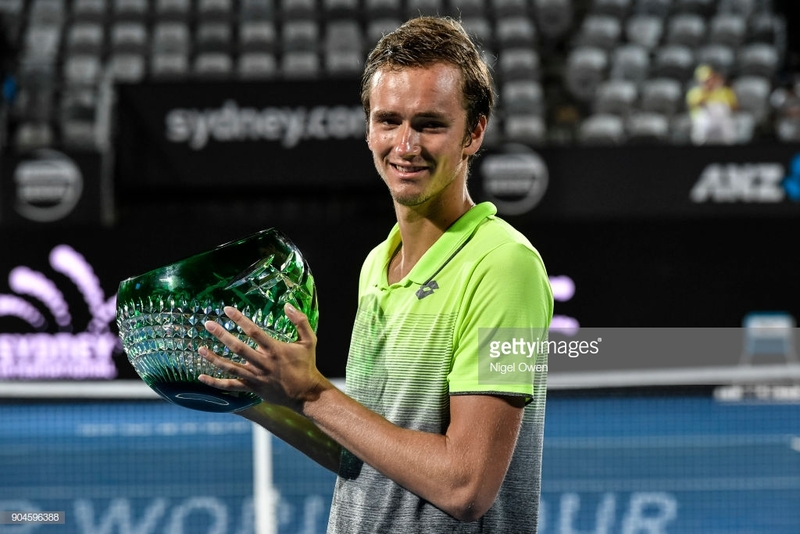 Defending champion Daniil Medvedev looks to be starting 2019 much the same way he began 2018 as he is in the Brisbane final. When he arrives to begin his title defense, he'll square off with either Jordan Thompson or veteran Adrian Mannarino after a first-round bye. The man the Russian beat to claim his first career title is seventh seed Alex de Minaur. The young Aussie faces Dusan Lajovic while a fourth qualifier will face Spaniard Albert Ramos-Viñolas. Who will claim the Sydney trophy? The title should be won by one of the NextGen players with Tsitsipas and Medvedev leading the way. The Greek claimed his first trophy in Stockholm while the Russian added two more trophies to go with this one. De Minaur thrilled the home crowd with his run to the final last year and could very well go one step further if he gets by a finals rematch with Medvedev. Tiafoe was the Delray Beach champion and looks to be steadily on the rise. Don't count out Klizan and Pouille, both explosive talents, but maddeningly inconsistent. With good draws, it would surprise no one if either lifted their first piece of silverware next Sunday.